Section 366 of the Companies Act 2014 has made provision for the adjustment or revision of financial statements to be made easier. Under previous acts, alterations of this type were only allowed when accompanied by an application to the High Court. This new provision under the Companies Act 2014, has been implemented to cover a range of inconsistencies or errors in financial statements. It has been developed in response to clerical, company law or general accounting errors and corrections that happen in many cases. Factors in the requirements of the Act, an International Accounting Standard inconsistency or factual elements of a Directors’ Report can all be addressed using this new procedure. Indeed, it is worth noting that even statements that have been approved by the board in the correct manner can be altered in this way. Do I need to make an Application to the High Court? 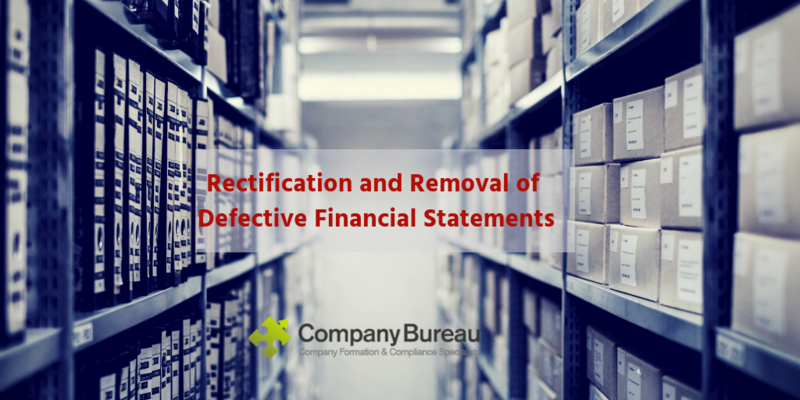 While Section 366 of the Companies Act 2014 allows for the adjustment of defective financial statements, it does not provide for the removal of the incorrect original from the public register. In some cases, the financial statements may contain information that should or can be omitted from the register. Even with the above provision in place, the only way to completely remove company financial information from the public register is to make an application to the high court. An affidavit is drafted up, signed off on by the directors of the company and is then submitted to obtain a court date. The barrister will then present the case for the removal of the accounting errors and corrections, providing support as to why it should no longer be available on public record. Company Bureau can aid with an application under Section 366 of the Companies Act 2014. In addition, if wish to find out more about the treatment of company financial information, or accounting errors and corrections don’t hesitate to contact the team at cosec@companybureau.ie or call us on 01-6461625. Should my start-up company register a Trademark?